The city of Fairhope, Alabama was founded by a group who wanted nothing more than a ‘fair hope’ of success. They built a community on the eastern shore of Mobile Bay, on the Gulf of Mexico. The beautiful white sand beaches on the bay are just one of the many stunning features that make Fairhope a visual gem. Now 100 years after its creation, the community has been developed to fulfill every hope of those original founders. It has a very active arts community, a high-quality school system, and great opportunities to work and play. With all this to offer, it still retains its small-town ambience and neighborly appeal. Situated in the northwest corner of Mobile Bay lies the city of Mobile, Alabama, within easy land or sea reach. All the excitement and amenities of a major metro area can be found in this city of 200,000 people. In contrast to the metropolis across the bay, Fairhope itself is home to only about 16,000 citizens. But each of these residents feels that Fairhope provides the best small-town environment in the state of Alabama. The city of Fairhope, Alabama was settled by a group of 28 ‘single tax colonists’ who sought land in the South. The single tax designation refers to their belief that just one land tax should be levied on all citizens. With an admirable spirit of cooperation, these individual colonists founded Fairhope in 1894, on a tall bluff overlooking Mobile Bay. Soon after founding, this single tax colony had support and financial backing from people relocating from everywhere in the country. By 1908, the city had grown to a population of 500, and early in the 1930’s, it took on administrative functions. The many parks around the town, as well as the quarter-mile long pier then came under the watchful eye of the city. Since those times, Fairhope has grown and come to be known as a vacation resort, as well as a great place to live permanently. Its beautiful beaches, parks, and idyllic weather have attracted all kinds of artists and craftsmen. By the time of the 1970’s however, growth had become stagnant, and the city’s appeal was diminishing. In stepped Mayor James P Nix to reverse that trend, with a vision of making Fairhope a quaint European-style community. Elected to seven consecutive terms for his visionary progress, Nix revitalized Fairhope. Today, downtown Fairhope is literally filled with gourmet restaurants, relaxing cafés, boutiques, and art galleries. One thing hasn’t changed though – the city retains its spirit of cooperativeness and pride. More than 70% of all townspeople volunteer to do community work during the year. Every newcomer to the area is impressed by the town, the people, and the quality of living. There is literally something for everyone in Fairhope. If you enjoy seeing local landmarks, you’ll love the Fairhope Pier, which juts out into Mobile Bay. Hand-in-hand with that goes beautiful Fairhope Beach, a sandy haven on the Bay’s eastern shore. The high bluff on which the city was originally founded, still towers above the bay for all to see. Mosher Castle is magnificently constructed, and has an amazing story to tell. The Weeks Bay National Estuarine Research Reserve studies fascinating area wildlife. The Fairhope French Quarter is a great place for residents and visitors to shop, dine, and discuss whatever comes to mind. The LaFleur Art Studio provides easy-to-digest lessons, at which students create their own works of art. Sports enthusiasts will love the Rock Creek Golf Club, with its well-maintained fairways and greens. Weeks Bay Plantation offers delicious berry-picking for the whole family, at a functional plantation. The Fly Creek Marina provides excellent shelter for local boaters to put up their boats when not in use on the bay. The BENT Outfitters Fishing Charters offers numerous opportunities to land the big one for fishing enthusiasts, and enjoy time out on Mobile Bay. Each year there is an Eastern Shore Kids’ Market attended by residents of Mobile Bay, where all kinds of merchandise for youngsters can be purchased. In September, there is the annual Fall Flea Market, which the whole town turns out for. Known as the Dragonfly Festival, all kinds of goods can be bought and sold at this annual marketplace. Each October, Fairhope sponsors a Witches Ride to celebrate the Halloween season, and get people involved with the season. For art lovers, the Marrietta Johnson Museum provides a gallery full of fine works of art to marvel at and appreciate. 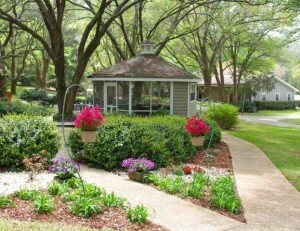 Fairhope is one of the best communities in the US to retire at. Recognizing its founding roots, Fairhope still operates as a Single Tax Corporation. This means that the community owns the land, and leaseholders each pay a tax between $500 and $1,000, instead of paying formal property taxes. Fairhope now comes very near realizing the Utopian model its founders had in mind in 1894. It’s a great place for artists, gardeners, and those who love working or shopping in boutiques. Since it’s actually a suburb of Mobile, there’s easy access to all the big-city amenities you could ever want. Fairhope is a lovely, quaint, European-styled community, where each day is like a stroll through a fairy tale. The community is literally surrounded by lush park areas teeming with flowers, trees, and exotic bushes. This idyllic community was chronicled extensively in a 2001 article appearing in the Washington Post, called “In Alabama, Utopia Found”. Fairhope has frequently been listed in the top rankings of best communities to live in. One of the truly outstanding features about the city is its high-quality school system. It has seven public schools and three private schools, with a student-to-teacher ratio of 14:1. Average test scores of Fairhope students are at the 91% level, compared to 80% statewide. The AreaVibes survey of Best Family Living communities rates the educational system in Fairhope a solid ‘A’. Greatschools.org ranks Fairhope at 9 out of 10 for its high-quality school system. Fairhope Primary School and Fairhope Intermediate School both earn 9’s for educational excellence. Fairhope Middle School and Fairhope High School both earn solid 10’s for their excellent tutoring. Fairhope also ranks very well in the area of employment, with just 3% unemployment, compared to 6% statewide. Average earnings for area males are in the neighborhood of $50,000, well above the state average, around $35,000. Home health care abounds in the Fairhope area, and is provided by several outstanding services. Diversified Healthcare LLC, and STS Home Health Care are two of the most prominent of these. Hospital care is offered to the community by Thomas Hospital, a mainstay of the community for more than 50 years. American Family Care offers emergency and walk-in care for family members when injuries arise suddenly. You could look a long time for a city in America that offers all the advantages of Fairhope, Alabama – and you still might never find it. Founded by 28 idealists who wanted a fair opportunity for everyone, the city has come to be exactly that. If you are looking for a great place to raise your family, or to retire comfortably in a beautiful, sunny location, Fairhope is the place for you. You can become involved in the community with the same spirit of the original founders, and have a strong sense of purpose. Living in Fairhope, Alabama will be more than just passing the time – it will be enjoying the time, and making best use of it.